This guide will help you understand the private placement market. What is a private placement? What are types and examples of private placements? What is the private placement process? Learn more with Fundz. What is SEC Form D? As stated by Investopedia, a private placement is a capital raising event that involves the sale of securities to a relatively small number of select investors. According the to the SEC, under the federal securities laws, a company may not offer or sell securities unless the offering has been registered with the SEC or an exemption from registration is available. Private placements can be made by leveraging one of those exemptions. 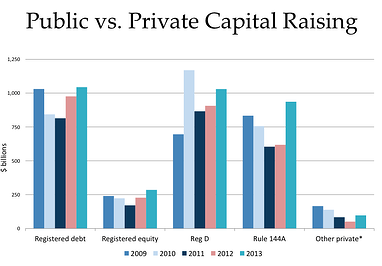 The market of private placement is massive, far larger than the registered equity market. The Reg D market stands at over a trillion dollars today. From one perspective, this dwarfs the current IPO market. Investors in private placements include large financial entities including, banks, mutual funds, insurance companies and pension funds, as well venture capitalists, angel investors and other entities. There are various types of private placements. For example, as stated by Wikipedia, PIPE (Private Investment in Public Equity) and SEDA (Standby Equity Distribution Agreement) are forms of private placements. They are often a cheaper source of capital than a public offering. In the U.S., a PIPE offering may also be registered with the Securities and Exchange Commission on a registration statement instead of being completed as an unregistered private placement. Most private placements are offered under the Rules known as Regulation D. While not requiring the formal process and paperwork of a typical public offering, private placement disclosure documentation must still be filed with the SEC. Conversely, a public issue/offering is when securities are made available for sale on the open market to any type of investor. 1) You hear about friend's startup that just raised a relatively small amount, say $200,000 for a stake in their company. Chances are, that was a private placement to one or more high net-worth investors, known as angel investors. 2) You read about a high-tech company raising $10 or $30 million in what you hear is a "Series A Funding Round" or “Series B” investment. That is also a private placement, probably to more than one venture capital funds. 3) A hedge fund raises $10,000,000 for investment purposes from a couple institutions. Within 15 days of the sale, they file a Form D with the SEC as this is a third type of private placement. According to The Securities and Exchange Commission (SEC), Division of Economic Risk Analysis (DERA), from 2010 through 2016 $20.2 trillion was raised in total capital with $8.8 trillion through registered securities and the majority, $11.38 trillion from exempt offerings, i.e. private placements. The private placement market has grown considerably in recent years. It was $1.87 trillion in 2015 and $1.68 trillion in 2016. In 2014, there were 33,429 Regulation D offerings reported on Form D filings, accounting for about $1.3 trillion raised. Capital raised through Regulation D offerings continues to be positively correlated with public market performance, suggesting that capital formation in the unregistered market is pro-cyclical, i.e., the strength of the unregistered market is closely tied to the health of the public market. Consistent with the original intent of Regulation D to target the capital formation needs of small business, the median offer size of non-financial issuers is less than $2 million. Regulation D is a series of six rules, Rules 501-506, establishing three transactional exemptions from the registration requirements of the 1933 Act. In other words, if a company meets the requirements, they are exempt from having to register the securities they are looking to sell. SEC Form D is a document filed with the SEC that most firms issuing private placements are required to file within 14 days form the first sales of securities. These filings are created by the issuer's attorney. Outside of large institutions and funds, one group that participates in private placements are referred to as “accredited investors”. Especially, when a startup is looking for its first funding, they will often approach this group. So who are accredited investors? To meet the requirement of Regulation D or the requirements of Section 4(2) of the 1933 Act (the private placement exemption), the issuer is almost always required to make extensive disclosures regarding the nature, character and risk factors relating to an offering. The disclosure document often is labeled “Offering Memorandum”. Offering Memorandums are created by an issuer’s attorney.